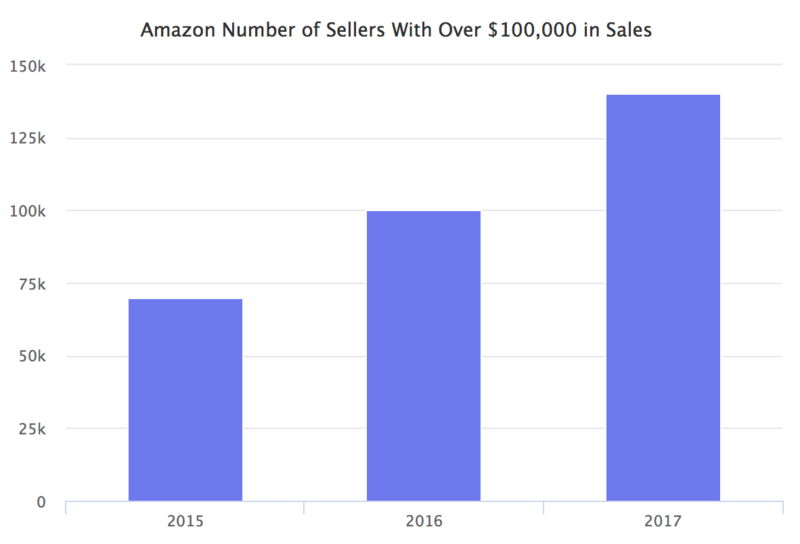 In a statement issued this morning Amazon announced that more than 140,000 sellers surpassed $100,000 in sales on Amazon marketplace in 2017. The number of sellers with over $100,000 in sales in a year has doubled since 2015. It grew from 70,000 in 2015, to 100,000 in 2016, and now to 140,000 in 2017. If it continues at this pace it will reach 200,000 this year. It is interesting that the marketplace is outgrowing top sellers. Meaning every year more sellers are able to build a business. Instead of the top sellers only getting bigger, and capturing all market growth, the growing marketplace allows more space for new sellers to grow. In most markets for new entrants to grow the old ones need to shrink, but so far this doesn’t seem to be the case on Amazon. Amazon has rarely commented on the size or growth of the marketplace, resulting in a common misconception that there are more than 2 million sellers on the marketplace. While according to our research there are more than 5 million Amazon sellers worldwide. However the number of sellers with over $100,000 in sales is a much better indicator of the success of the marketplace. Last year over a million new sellers joined the marketplace, but very few of them became active. Today Amazon also said that more than 300,000 US-based sellers started selling on Amazon last year. Many more sellers joined across the world, but this number by itself is not a valuable metric. The 140,000 figure is the number of sellers who were able to build a business. And thus is the key. Some of the 140,000 sellers are not doing it alone, and have multiple employees. Which means there are hundreds of thousands of jobs created and enabled by the Amazon marketplace. Given that One Third of US E-Commerce Comes from Marketplaces, and marketplaces continue to outgrow Amazon itself, the opportunity is only getting bigger.